Wheat & Weeds: What A Croc! Shamelessly pinched from Kaching, who pinched it from here. 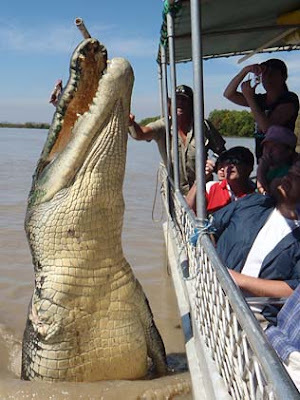 Giving me nightmares this evening: it's no photoshop, it's a huge missing-legged croc named Brutus giving a show to tourists on the Adelaide river. Incidentally, he lost his leg to a shark. Life is different in Oz.